A new report warned that the United States is slipping on post-secondary degree completion compared with other nations, falling to fourth overall among adults and 10th among young adults. We will ignore the underling causes of this trend "at our peril," the report's authors said. But what can K-12 institutions do to address the problem and help reverse the trend? Educational attainment isn't advancing fast enough to meet even near-term demand in the workforce, let alone longer-term demand. But, according to the authors of a report released by the Lumina Foundation, K-12 schools and education technology can play a role in turning that around. K-12 can help with that, according to Jim Applegate, vice president of program development at the Lumina Foundation, who recommended, among other strategies, beefing up outreach programs beginning in the middle school years to prepare younger students for college. "Lumina recognizes the importance of dramatically increasing the number of prepared student participating in college" Applegate told us. "In fact, increased preparation is one of the three critical outcomes in our strategic plan that must be achieved to reach the big goal. We support work to (a) increase alignment of standards and assessment between K-12 and higher ed; (b) expand outreach networks that support low-income students college attendance beginning in middle school; and (c) support access to financial aid and increase financial preparation for college." Technology, Applegate said, also has a role to play in increasing degree attainment. "Technology solutions will ... be key to reach K-12 students with the information they need to prepare for college and offer dual and concurrent enrollment courses to accelerate their progress to degree," he said. "We anticipate the development of very different models for delivering higher education involving multi-sided platforms that result in a system where more and more college comes to students rather than students going to college." Colleges and universities will also be turning more and more toward online and blended learning to accommodate larger numbers of students. 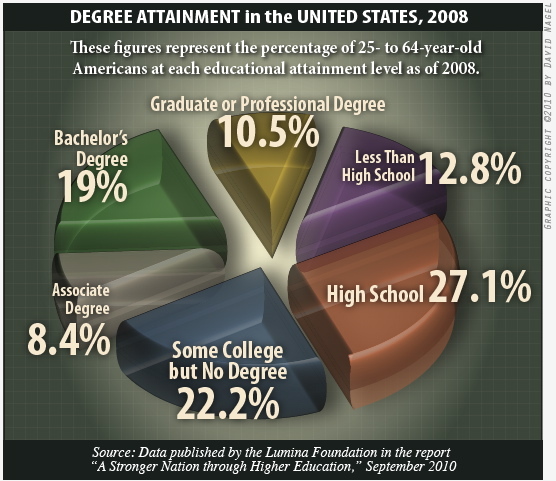 The report also stressed the importance of communicating the imperative for higher degree completion, including the fact that, even in the current recession, the pay gap between college graduates and non-graduates is increasing and that, by 2018, according to one study, 60 percent of jobs in the United States will require some form of post-secondary education. A separate report released by the College Board Advocacy & Policy Center, "Education Pays 2010," backed up the assertion that the salary gap is expanding, describing a "widening gap between college graduates and those without a college degree [that] makes efforts to increase educational attainment even more important."